I recently taught a 10-week mural class with 11 students at The Sharon Academy in Sharon, Vermont. 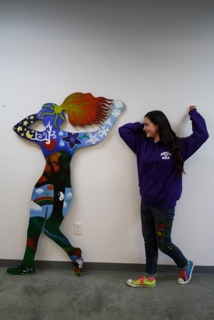 In these photos, students are posing with their self-portrait “bodies.” I guided students through a process of cutting out their body shapes from plywood and then painting what they currently identify with on each. For instance Deniz, an exchange student from Turkey, has painted elements in his body that reflect his love for his homeland, travel, the sea, and basketball. All of the students’ paintings will be screwed to the exterior walls of the high school. I call this “humanizing” the skin of the school. 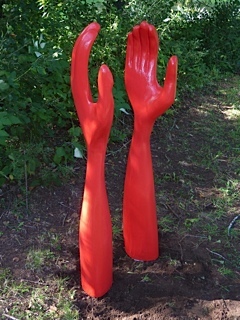 See more photos of student work and read about my teaching and workshop offerings. By Jay Mead, with Dominic Stucker. The sustainability movement is in urgent need of re-invigoration. For too long, we have relied on a problem-focused, doom and gloom approach that engenders fear. While fear can motivate action, it more often paralyzes people, trapping us in anxiety and despair about eroding futures for our children and grandchildren. Seemingly surrounded by catastrophes and insurmountable challenges, we usually cannot see beyond the perpetuation of our broken, fossil-fuel-dependent socio-economic system. The word “sustainability” has been used now for decades; for some it carries hope, while for others it has lost it’s meaning through misuse in marketing and “green washing.” Together, let’s seek to reclaim sustainability as a viable aspiration and a way of life for all of humanity, using art and creative expression as a path to do so. I believe that people need to connect to sustainability through their hearts; this orientation can happen through art and the cultivation of right brain thinking. I call this approach the “Art of Sustainability,” a practice and way of being with one another and nature that emphasizes creativity, connection, and hope. Being in this great moment of human history, we are conscious of the choices we make and have the agency to create a sustainable future for all. This moment is what deep ecologist, Joanna Macy, refers to as “The Great Turning” and what systems thinker, Donella Meadows, called the “Sustainability Revolution.” Envisioning a just and thriving world is an act of faith, a recognition of the potential for change in oneself and in society. Shared vision can transcend the pervading mindset that we are separate from nature and help us bring about a life-sustaining world. The current unsustainable path that humanity treads instills many with fear of mass pandemics, climate change, destruction of what we know and love, technological oppression, and the loss of individual freedom; the list goes on. We can, however, take a different path to sustainability that engages the heart and inspires us to do what humans are so good at: creative problem solving. So what is it that moves us to act on behalf of this amazing place we call Earth? I know that I value beauty, the essence of nature, and the fullness of sensory pleasure that comes from experiencing wildness. The simple fact that there is so much yet to be learned about and experienced in the natural world is the essential fire of my curiosity. Biomimicry, for example, is a practical application of this passion to observe and learn from nature while serving the needs of humanity. To embrace the Art of Sustainability is to embrace a way of living that is playful, and filled with wonder and infinite possibility. As poet Mary Oliver says, “The universe could have been created ugly, and would have functioned. And yet there is beauty everywhere in creation. Beauty gives us an ache to be worthy of that creation.” The Art of Sustainability gives us a pathway to demonstrate our love for creation and creativity. Read more about my Art of Sustainability approach and related workshop offerings.